You are currently browsing the tag archive for the ‘baghdad streets’ tag. The Better World island exists, in the words of its owner, Riversong Garden, “to network, nurture, and build awareness about groups, individuals and issues that affect our world.” (Quoted from the September edition of PrimPerfect magazine). 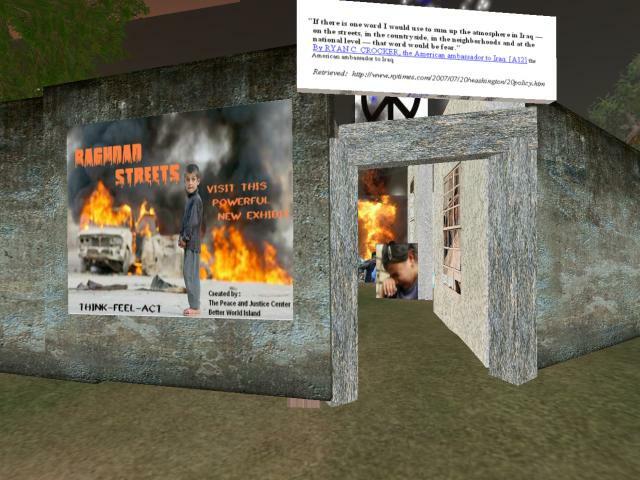 There are various different areas on the island, most of them dedicated in one way or another to raising people’s awareness about situations that exist in the real world, and encouraging them to get involved in actions which can help. For my first day on the island, after taking a stroll to watch the sunrise, I made my way to the Baghdad Streets exhibition. “Exhibition” is the wrong word. “Immersive experience”, perhaps. Not quite a simulation (though there are elements of that), but more than just a static collection of pictures. Even before you enter through one of the stone archways, you can see the flames rising from the street, and hear the sounds of guns, of people sobbing…it is a deeply involving experience. At various places there are notecard providers. One of them, for example, is from an Iraqi student describing her own experience and feelings (bringing an immediate and highly personal note to the exhibition). At one place there is a rather incongruous tip-jar, above which floats the message “But what can I do?” And this is the other point about this exhibition. It is not there simply to bring home the suffering of the ordinary people in Iraq. It is there to encourage you to do something about it, and to suggest what you could do. So you have opened your heart. So you have felt compassion. engendered by the US occupation of Iraq. withdrawing our troops from Iraq as soon as possible. with your enemies. It all starts with you.